Retail Stores in Malls – Standing out! Home News Retail Stores in Malls – Standing out! Malls and shopping centers are the shopaholics’ dream place to visit. Store after store, just door to door from each other, every possible type of shop you can imagine. And often significant competition for each store with main rivals situated at various points around the same mall. For fast food outlets, coffee shops, and restaurants, it’s a captive audience of hungry shoppers. All who need to be re-fuelled with an array of food and beverages. There is little wonder that on weekends and evenings malls are incredibly busy places to visit. Sometimes even during the work day! For mall stores, they are ideally situated to sell. But naturally, as a retailer in a concentrated area, you are facing a challenge to make your store look different and stand out from the other stores in the mall. And that is AGRetail’s forte – branding and display expertise for retail. 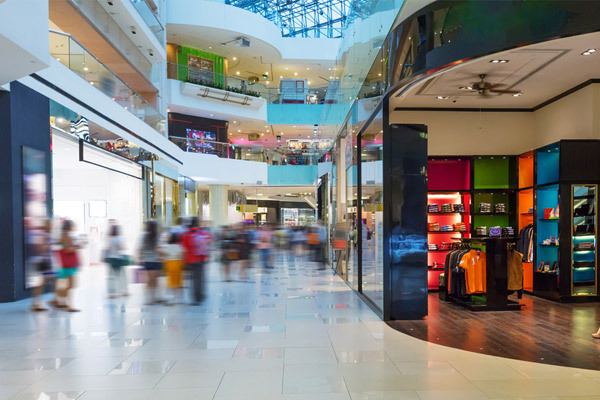 No matter where your mall stores are located, it’s important you capture the attention of your potential shoppers and get them to come into your store. Rather than your competitors’. Whether you’re located in the main thoroughfare of the mall, in a quieter corner or near the entrances. There are so many ways to achieve that! Innovative and creative storefronts make a big impact wherever you are in the mall. It’s difficult to walk past a bright and bold unique display that makes your customers feel compelled to find out more. AGRetail can help you design and install a shop front that not only turns your customers’ heads, but stands out from the crowds. If you’re opening a new store or during refurbishment periods, retail barricades can help communicate your branding and company values to your customers. Both old and new. And when used in a busy mall, they provide a distinct look that stands out from the storefronts around it. Helping you gain a competitive advantage. If you’re keen to use promotions to attract shoppers, window graphics are a fantastic short-term option. Easy to install and remove without residue and completely customizable in any color or pattern. You can change your promotions and messages whenever you feel like it. Running a store in a mall has many benefits but can be competitive, so AGRetail offers you so many ways to stand out from the crowd. Call or email us today for more information.